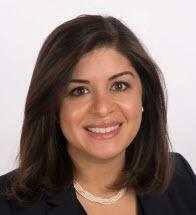 Marize Helmy, Esq. has been practicing in the areas of on Estate Planning, Trusts, Medicaid, Real Estate, Guardianships and Estate Litigation for Michael A. Manna & Associates, P.C. since 2006. She was a paralegal in the field while obtaining her Bachelor's degree from Fordham University, prior to obtaining her Juris Doctor from SUNY at Buffalo. Marize is keen on assessing a client's long term care needs and creating an asset protection plan specific to a client's goals, whether it be protecting assets from the costs of long term care, reducing or eliminating death taxes, establishing supplemental needs trusts for disabled loved ones, assisting with placement and securing benefits to pay for care or simply preparing an estate plan, she is proficient in these areas of law. Marize is also versed in tax planning including drafting and implementing irrevocable grantor trusts. In addition, she has submitted over one hundred Medicaid applications to various Board of Social Service offices throughout the state. Outside of the office, Marize has been teaching in the community at support groups, community schools, senior groups, and other community based organizations on topics of Elder Law, Estate Planning, Ethical Concerns for the Elderly, Guardianships and Senior Scams.